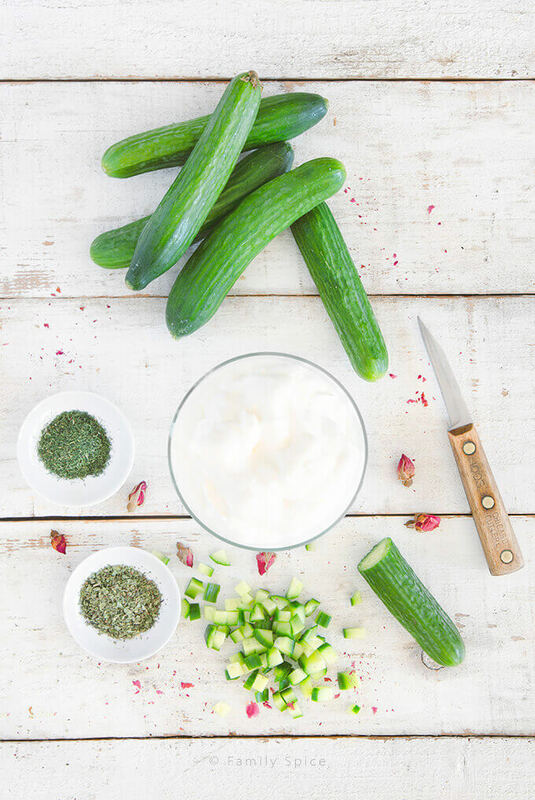 You will find yogurt with cucumbers in almost every middle-eastern culture. This version is Persian, Mast o Khiar, and is made with dill and mint. Yes, this is not a back-to-school post! I realized that with all of this focus on kids, it’s time to talk about something else. You know, it’s a mommy-syndrome to rattle on and on about our kids. Here in San Diego, the weather has turned HOT again. And that means this momma does not want to to cook and heat up the kitchen. These are the times we are always looking for cool snacks and meals that don’t have sugar. 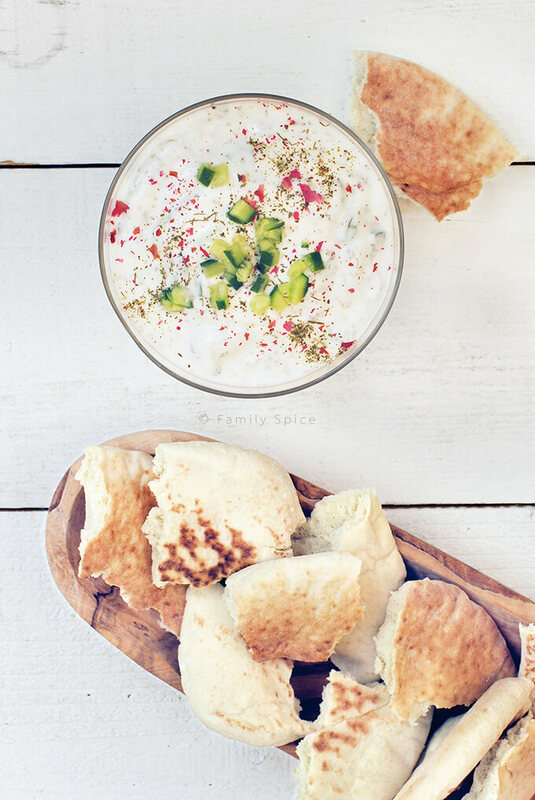 And this Persian Yogurt with Cucumber (Mast o Khiar) is always a family favorite. What is mast o khiar? Mast o khiar translates to “yogurt with cucumber.” It sounds so simple and yet it is one of the most delicious treats out there, in my opinion. 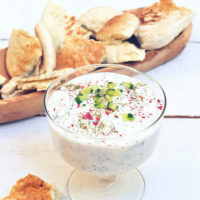 Persian yogurt is mixed with either dill or mint, in my case both, as well as chopped up cucumbers, salt and pepper. Depending on who is making it, mast o khiar can include other ingredients, too. You can also mix in raisins, chopped walnuts and dried rose petals. But its simplest form, with herbs and cucumbers, is most popular. What cucumbers should I use for this cucumber dip? 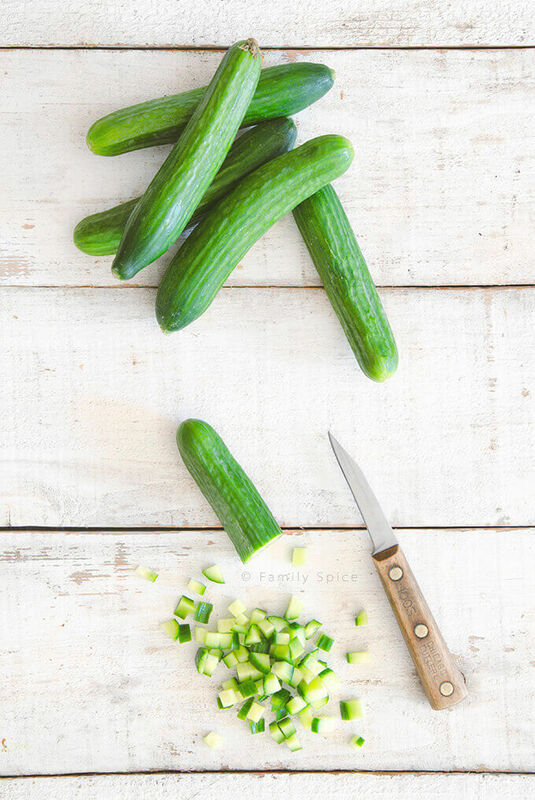 There are basically three types of cucumbers available at the grocery store: the traditional cucumber, the English cucumber and the Persian or mediterranean cucumber. Quite honestly, I can’t even eat a regular cucumber any more. It is typically filled with too many seeds, full of water and the skin is too thick to eat and must be removed. For mast o khiar you definitely want to use a seedless cucumber. Obviously the small seedless Persian cucumbers are my first choice. They are always crisp and you do not have to remove the skin, it is edible and perfect. When I can’t find Persian cucumbers, I use the seedless English cucumber. They are those real long cucumbers covered in plastic wrap. If you do use English cucumbers, I recommend peeling the skin off unless you like the thick skin. 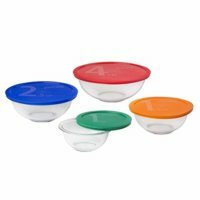 What yogurt should I use for mast o khiar? Persian yogurt is very different from Greek yogurt and the mass marketed Dannon/Yoplait you find in the supermarket. Recently in one my foodie facebook groups, there was a great discussion about the virtues of yogurt and our personal favorites. I am not dismissing Greek yogurt. It is thick and full of so many good things for you: probiotics, calcium, protein…. But, it is rather bland in flavor. This is a virtue when you are adding your own flavorings like fruit, honey or granola. I love my Greek yogurt for breakfast. But not for my mast-o khiar. Persian yogurt has a bit of sourness to it. This is because when you are making yogurt, you are letting it sour for up to 18 hours! It’s easy to make your own yogurt. I wrote all about how to make yogurt at home here. If you love Greek food then you know all about tzatziki sauce. That’s the white sauce served with your favorite gyro sandwich. It is very similar to Persian yogurt with cucumber, but it is made a little bit differently and tastes a little differently. Tzatziki usually has olive oil, vinegar or lemon juice mixed into it. It also has garlic and is made typically with dill. And of course, the base is Greek yogurt, which has a different flavor than Persian yogurt. Overall, they are very similar to each other with some minor differences. During the newlywed years, the hubby and I had great… discussions about how to make this simple dish, masst-o khiar. It’s yogurt with cucumber- How complicated can it be? Well, my family made it traditionally with dried dill. My husband’s family made it with dried mint. We both insisted that our family’s version was the right version. Finally, I started making mast o khiar with both dried mint and dried dill. Peace was brought to our house. And I continue making mast o khiar this way. Serving Suggestions: Chopped walnuts and raisins can also be added to the yogurt. 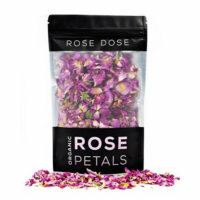 You can also garnish with some dried rose petals. Great as a side dish or as an appetizer, served with bread or potato chips. I LOVE Persian yogurt! I cannot believe I have everything for this recipe yet never made it at home! I’m going to pick up Persian cucumber on the way home from school today. I’m so excited!!! Hi Laura! I love tangy flavors; I will lick the inside of a sour cream container with very little shame. 🙂 So… I need to get acquainted with Persian yogurt, QUICK. Do you also cook with it? What is a brand I should look for? Hi Kim! My personal favorite is Ab Ali. You can definitely find in OC/LA area. 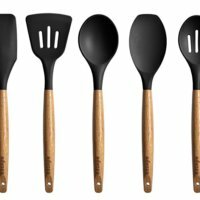 I have also used it for marinating, great meat tenderizer, and baking. What a great appetizer or snack! 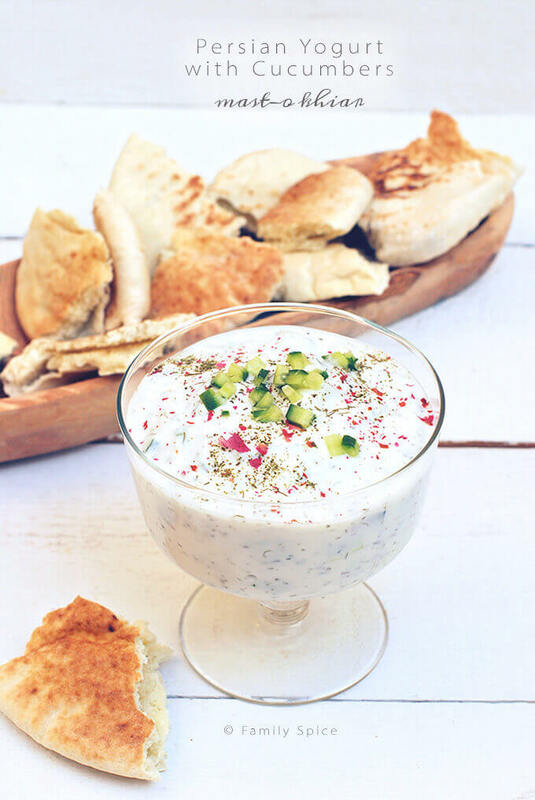 I’ve never tried Persian yogurt but it sounds great! Love Persian food and all their different yogurts too – i would rather have this with a burger than ketchup or mustard. So good. I can’t wait for the yogurt-making post. I’m very intrigued and want to try Persian yogurt! I don’t believe I’ve ever had Persian yogurt. It sounds intriguing! You have to post your recipe for making it soon – I’m totally curious to see how it differs from other kinds of yogurts. Anyway, nice recipe. I make a similar Indian recipe with fresh mint and cayenne pepper (not a lot, just a touch to spice it up slightly). This looks really good – thanks. Laura dearheart: a Persian yogurt making lesson soon, please! Notice in your previous post you did use the Greek one! Would love to taste the difference! And, are Persian cucumbers the same small, slim ones as what i know as Lebanese ones? OK, i make tzatziki all the time, but love the variations you suggest on this one for the ‘tartier’ [?] Persian kind! Have a lovely weekend! !